Singapore is a wonderful place to eat. In my previous posts about Singapore, I mentioned that Singapore is a very multi-cultural city and that is reflected in the food options that are available. From the research that I had done prior to my trip, I never found a lot of information on real authentic Singaporean food. I found a lot of information on food in general but nothing that would say that this or that was truly originated from Singapore. People had told me that the food is from Singapore but I had a tough time telling the difference between what I was told to be Singaporean food and what appeared to originally be Chinese/Indian/Malay/Indonesian food. This was further exacerbated as the closest I came to eating real Singaporean food was in Canada at one restaurant that was a mix between Malaysian, Thai, and Singaporean food. While it may be difficult to tell the difference between real Singaporean food and dishes that had been localized with time, there are three distinct Asian types of food that can easily be found in Singapore. The first is Malaysian, or rather South-East Asian. One will have to forgive me if I am not in touch with the differences of each country’s local cuisine, but unfortunately I am not an expert on Singapore. The first dish that I can think of that is part of the area is Kaya Toast. Kaya is a type of coconut and egg spread and Kaya Toast is when you take this spread and put it in a toast sandwich along with a small wedge of butter. It reminded me of eating cinnamon toast as a child with lots of sugar. It was delicious and something that I would eat, not just for breakfast but also for a snack. 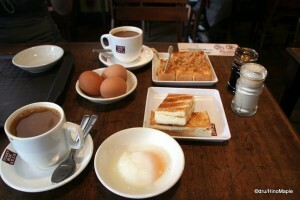 The typical way to order Kaya Toast is to get a set with Singaporean coffee and eggs. Singaporean coffee reminds me of what I think is a Vietnamese style, or rather originally French coffee. Using a tall metal pot and a high pour to add air into the coffee itself is wonderful technique that is employed in Singapore. They also use condensed milk and hot water to keep the coffee from being too strong. The eggs are soft boiled eggs that can be used as a dip for the Kaya Toast or eaten plain with or without soy sauce and black pepper. One might wonder, what is the “correct” way of eating Kaya Toast, and if the Discovery Chanel is true, there is no correct way of eating Kaya Toast. You can eat it in any way you’d like. Another traditional dish I noticed would have to be the noodle dishes. 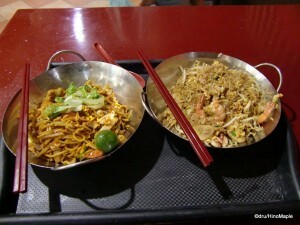 Dishes such as Mee Goreng and Bee Hoon were great. They are a regional take on Chow Mein or Yaki Soba. Almost every Asian country has their version of fried rice or fried noodles. 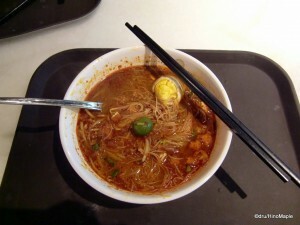 The version I had in Singapore was delicious with heaps of seafood. In every food court and hawker’s market I could find these home style foods. The smells were great and there were small citrus fruits included with these dishes that looked and tasted like sudachi in Japan. The small citrus fruits were a perfect complement to the spiciness of the noodles. 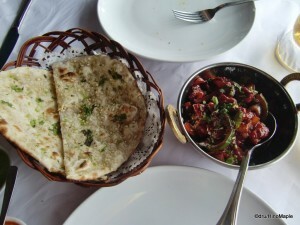 I also had a chance to eat Lahksa, which is more Indian in style. It was a spicy soup, almost curry like, with noodles that reminded me of a soup curry rather than an actual Singaporean dish. One item that I didn’t have a chance to try was the satay. I was always unlucky when trying to order it. I always wanted to have satay in that region as I wanted to compare it to the satay that I could get back in Vancouver. Rather than allowing it to be a regret, I thankfully think of it as just one more reason to go back to Singapore. In terms of Indian food, there is a lot. With Little India just a stone’s throw away from my hotel, it was easy to get Indian food, but I never went to Little India for it. The first chance I had for Indian food was at Boat Quay. I went to a restaurant that advertised Northern Indian food and it was delicious. I don’t know what the difference is between Northern and Southern Indian food but my guess would be that Northern Indian tends to be “drier”. By this, I am comparing it to Indian food that I have bought in Tokyo, which is highly unlikely to be authentic. I ordered what would seem to be regular food from India. I had some samosas, naan, curry, and tandoori chicken. The Samosas were delicious and very much alike the potato samosas I had in Vancouver. I also had papadums. These are similar to Indian “chips” with a mint dip and a mango dip. It was not what I expected but not terrible either. The naan was a surprise. I am used to the huge triangle shaped naan in Japan, but these were simple circles and probably more traditional of India or northern India. The curry was also a bit of a surprise. I ordered a chili chicken curry that had almost no sauce. Rather, the sauce was so thick that it looked more like sweet and sour chicken, but a lot spicier. While it was a surprise, it was also very delicious. 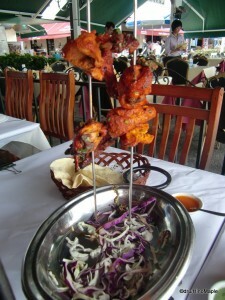 The tandoori chicken was the house specialty and it was as expected. Not too dry as some places do but just the right amount of spice for me. I had one other opportunity to have Indian-like food in Singapore. I ordered some curry in a food court and it was also a bit dry overall. While the dry curry was good, it was just something I had to get used to as I had a bad experience with dry curry in the past. Chinese food is by far the easiest food to obtain. Everywhere I went I could see various types of Chinese food. Growing up in Vancouver, I had a great opportunity to taste various types of Cantonese style foods. 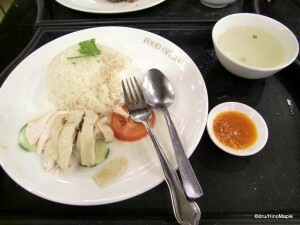 In Singapore, chicken rice is very famous. It is actually Haianese food but it was delicious and the ginger rice that I had with it was perfect. The rice had the scent of ginger but it wasn’t too spicy either. I also had a chance to eat some Chinese style pastries. Within the food areas of department stores, I could find various cakes and pastries. Singapore has many bakeries that sell traditional bread style pastries as well as flake pastries. I was happy to see I could get my favourite pastries in Singapore and I didn’t have to go to Hong Kong or Vancouver to get it. Japan is one of the worst places to get real Chinese pastries, and even in Hong Kong I have found it a challenge at times to get the ones I want as Hong Kong has been transitioning from the pastries that I know and love to a more Japanese style. Japanese pastries tend to be very good but the way they do things is not the same. Think of the difference between a McDonald’s burger and a gourmet burger. They are the same thing but done completely differently. Sometimes one is better than the other, but it depends on your mood. That’s how I feel about these pastries. Chicken rice and pastries aren’t the only dishes available in Singapore. You can also get dim sum, although I couldn’t get any due to bad luck or timing, noodles in soup, and various rice dishes. Because I ate in food courts, the food was somewhat skewed. I am used to eating in restaurants where I can share many dishes along with plain white rice. In the food courts, food is designed for single people and it was hard to try many different things at once. As you can see, eating in Singapore is varied. The food was all delicious and other than being a little scared of the cleanliness of the hawker’s markets, everything was fine. If I could, I would go to the hawker’s markets more often but I also felt a little strange as it was filled with locals. I stuck out like a sore thumb every time I walked through the hawker’s market that was between my hotel and the station. For some, it is a great place but with my own personality, I found it difficult to enjoy a meal there. The hawker’s markets are open from late morning until dinner time, but around dinner time they all start to shut down. You can easily find food during the day but by night things get a little difficult. It is a great adventure to try the hawker’s markets and next time, if I’m with the right people, I’ll have no problems going back and eating there more often. This entry was posted in East Asia Food and tagged Bee Hoon, chicken curry, chicken rice, chili chicken curry, Chinese Food, coffee, food, garlic naan, Indian Food, Kaya, Kaya Toast, Lahksa, Malay Food, Malaysia, Malaysian Food, mee goreng, multi-cultural, naan, papadum, samosa, Singapore, Singaporean Coffee, Singaporean Food, South-East Asian, sudachicurry, tandoori chicken, Thai Food by Dru. Bookmark the permalink. Such an insightful reading. Btw, back in Vancouver is it easy to find Indonesian food? Thanks! It isn’t hard to find Indonesian food, but it tends to be lumped into SE Asian food. It isn’t very cheap and my guess it is run by Chinese people. Maybe Singaporean Chinese. 😀 I don’t go there often but it isn’t bad. You probably can’t get pure authentic food though, but honestly, I just don’t know. Surprisingly, I am heading to KL in March for the F1 race. I have to see what happens but maybe I’ll take you up on that offer. 🙂 No worries on bak kut teh. I need to first find info on what to eat first before I decide what to do.